The Oslo accords, which were signed 25 years ago to wide acclaim, were supposed to inaugurate a new era of peace. For many observers, especially in the west, it raised the hope of an end to divisions and conflict although many in the region were far more cautious. 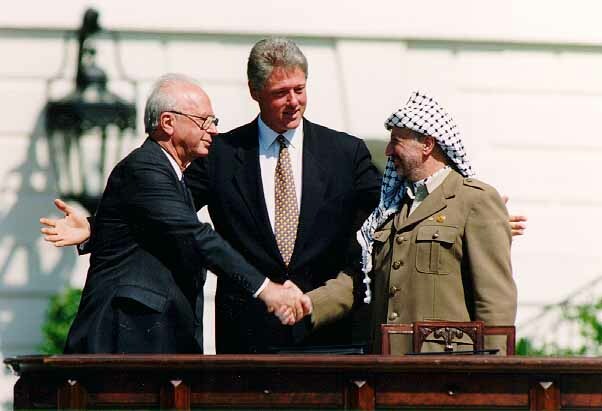 When Palestinian leader Yasser Arafat shook the hand of Israeli Prime Minister, Yitzhak Rabin, immediately after the signing of the Oslo accords’ declaration of principles by both sides, many Palestinians believed that the setting up of their own state was a first step on the path of true freedom. Today, 25 years later, it would not be wrong to say that few could have imagined what would transpire in the years that followed. Not only is an independent, viable and contiguous Palestinian state even more of a distant dream than ever before, but anything that can even remotely be called a state is out of question at this point. There are close to 700,000 Jewish settlers in the occupied territories of the West Bank and East Jerusalem, a three-fold rise from the time of the signing of the accords in 1993, and whose numbers are expanding at a massive rate each year. At that point however, Palestinians were perhaps justified in having high hopes. The first Intifada (uprising) had just taken place, and for the first time since its establishment in 1948, Israel had discovered that there were costs attached to maintaining an occupation of millions of people. No foreign occupation can last for all eternity. The first Intifada had given the Palestinians a newfound sense of confidence and motivation. Israel, which had killed more than 1,000 Palestinians during the uprising, was also feeling the pressure after receiving widespread international condemnation. During the second year of the Intifada in 1988, while speaking at Stockholm, Arafat declared that the PLO (Palestine Liberation Organization) “accepted the existence of Israel’. He also said that the PLO rejected and condemned terrorism in all its forms. He once again repeated his words while speaking at the United Nations General Assembly in Geneva, also accepting UN resolutions 242 and 338, paving the way for a potential, final and long-standing peace agreement between Palestine and Israel. Nonetheless, when talks began in 1993, chances of an agreement were bleak, and expectations of any fruitful results were minimal. This was because of the Madrid conference of 1991, jointly hosted by the United States and the erstwhile Soviet Union, had failed to lead to any breakthrough. The PLO was also not invited to take part in that conference whereas Israel, Jordan, Lebanon, Syria and a non-PLO Palestinian delegation took part. In 1992, after a change of government in Israel, Yitzhak Rabin, the new prime minister from the Labour Party, instructed his representatives to begin direct, secret talks with the PLO. The talks were held in Norway from December 1992 to April 1993. The terms which were finalized on August 20, 1993 were approved by Arafat on September 9, and recognized Israel’s “right to exist”, and resolved to work towards achieving a peaceful settlement of the issue. Finally, the accords were signed on September 13 by Arafat and Rabin at the White House. The terms of the accords also included the pull-out of the Israeli army from parts of Gaza and the West Bank, the holding of Palestinian elections as and when conditions became conducive, the setting up of an interim Palestinian government (the Palestinian National Authority) to govern areas under its control, Palestinian-Israeli cooperation in the energy, resources, trade, finance, communication, social welfare sectors etc. The accords also asked the G7 countries to come up with an economic development plan for Palestine. Israel officially recognized the PLO as the sole legitimate representative of the Palestinian people. During the five years after the records, both sides were expected to negotiate on all the pending issues and try and resolve them. These included the Palestinian right to return, the status of Jerusalem and the illegal Israeli settlements in the occupied territories. For the next two years, talks continued between both sides, culminating in the second Oslo Accords, signed in Taba, Egypt, on the 24th of September, 1995. The second round divided the West Bank into three areas of economic and security cooperation between the Palestinian Authority and Israel. Area A was to be under full Palestinian control, Area B under joint Palestinian-Israeli control, and Area C under full Israeli control. Areas B and C consisted of nearly 80 percent of the West Bank. Area A comprised only 3 percent of the West Bank in the beginning, but by 1999, it increased to 18 percent. Area C on its own represented 60 percent of the West Bank, with Israel controlling every aspect of it. In Area A and B, Israel retained full control of external security, leaving only the economic and social matters to the Palestinian Authority. To this day, Israel controls the external borders and security of all three demarcated areas, as well as still fully occupying Area C.
However, even this deal was opposed by a lot of sections in Israel. Right-wing Jewish extremist sections saw it as appeasing what they considered a terrorist organization despite Arafat renouncing violence in all its forms. They were also vehemently against the idea of giving up on land which according to them, was part of the ancient Biblical Jewish lands of Judea and Samaria. Among Palestinians, only the Fatah party supported the Oslo Accords. The other political sectors, such as the Hamas, Islamic Jihad and PFLP (Popular Front for the Liberation of Palestine) opposed it, and saw it as a betrayal of Palestinians. The Israeli right-wing opposition to the deal came to a head, first with the the killing of 29 people in the Ibrahimi Mosque in Hebron in February 1994 by a Jewish fundamentalist, and then with the assassination of Yitzhak Rabin at a peace rally by an Israeli man opposed to the accords on November 4, 1995,. Subsequent talks failed to yield any results, sparking the second Intifada in September 2000. 3,200 Palestinians and a 1,000 Israelis were killed in the following five years as a result. Since then, Israel has also invaded Gaza three times, in 2008-09, 2012 and 2014, killing thousands of Palestinian men, women, children on each occasion. It has also imposed a blockade on the Gaza Strip since 2005, after Hamas won the Palestinian national elections and took control of the territory. This has caused a severe humanitarian crisis for the approximately 2 million Palestinian residents of the strip. 2.5 million Palestinians in the West Bank and East Jerusalem live with 500 illegal Israeli checkpoints and in the midst of over 700,000 illegal Israeli settlers who are subsidized by the Israeli state and protected by the Israeli army. The years since Oslo have also been marked by Israel, with the support of sections of the US establishment, expanding its diplomatic and strategic footprint across the world, and indulging in intense lobbying to shut down any criticism of the country. In a sense, the Oslo Accords provided a veneer of respectability for Israel and allowed it to establish ties with countries like India, which was once an staunch ally of the Palestinian cause but became increasingly willing to sacrifice it for the economic benefits of aligning with Israel. Thus, even as Israel witnessed a right-wing resurgence, the international community closed its eyes to its violations of the agreement and the bad faith it displayed. It is thus that a situation has been reached where Israel and its allies, especially the United States under Trump, are proceeding on the ground to destroy the very possibility of the state of Palestine while the international community is able to do nothing but release tepid statements. The fact that Donald Trump can today talk of a ‘deal of the century’ without consulting the Palestinian Authority – a deal which involves the Palestinians giving up their claim to Jerusalem – is a sign of how much the ground has shifted. As is the fact that the relentless violence on Palestinians during the Great March of Return has not even led to any serious international action on Israel. The opposition to Israel and its colonial methods is yet again left entirely to the people of Palestine, whose bravery and spirit have been an inspiration, and their allies across the world under the banner of efforts like the Boycott, Divestment and Sanctions Movement, which have kept the flag of resistance flying high. Taking all this into consideration, on the 25th anniversary of the accords, if one were to re-examine and re-assess the consequences and aftermath of the meetings in Oslo, one could, in a long overdue moment of honesty to the Palestinians, rechristen those historic moments on the White House lawn as the ‘Oslo Frauds’.